Johansson is an excellent actor and a box office star. As such, she’s very expensive. In fact, she’s among the highest paid actors around, earning $35 million in 2015 and reportedly commanding $17.5 million for her role in Ghost in the Shell. I can’t find any specific information on the film’s budget but being familiar with the original work (a very high-concept, future sci-fi tale with robots and stuff) and the fact that this film is being positioned as a major Hollywood action vehicle staring one of the most popular stars working, I presume the picture’s a pretty pricey production. That’s why I find it odd that Paramount and Dreamworks would consider dumping even more money into digitally altering the lead actor to appear Asian. Testing the technology to see if it works costs money and if it does, the effect has to be applied to every frame of film featuring Johansson’s mug. That’s probably super duper expensive. Is Johansson really that big of a draw? Is her presence in the film enough to offset the cost of a feature length digital effect and the combined public relations nightmare of responding to criticisms of whitewashing and what I’ve already seen described as a digital form of Asian blackface? Oh, good gravy, Paramount. Really? 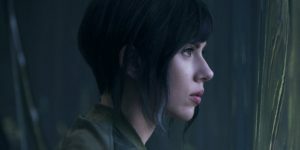 It sounds like you thought you were being criticized – not for testing effects to make non-Asian actors you’ve cast for Asian roles appear Asian – but for testing these effects specifically on Johansson and rushed to assure us that such digital alterations, if they ever saw the light of day, would only have been applied to background characters. But that strikes me as even sillier. You were honestly considering going to the trouble and expense of digitally altering your background characters to appear Asian instead of simply hiring Asian actors to fill the backgrounds of your shots? Seriously? Regardless, my question remains: why spend money to digitally make your actors look Asian when you can simply hire Asian actors? Sounds a lot cheaper and easier to me. Even assuming the effects tests were successful, are Asian-looking, non-Asian actors somehow more cost effective than Asian-looking, Asian actors? I have to imagine there are English speaking Asian actresses capable of playing this role though? also, Hollywood brings this on themselves when they try to show how “progressive” are, but would you know it it does not apply when casting apparently. I am ok with it, so long as they dont try to claim to be something they are not. Of course there are. How is that even a question? https://www.youtube.com/watch?v=XebG4TO_xss Last Week Tonight with John Oliver: Whitewashing (HBO) Hollywood claims they are diverse, but constantly have whit actors play non white roles. Yes, that is well known and uncontested. What is your point and how does it at all relate to this article or my response to your first comment? Are you somehow under the impression that I’m unaware of a pervasive and oft-discussed phenomenon that I just spent 500 words discussing a prominent example of? no my point was more that the way Hollywood likes to portray themselves, and how they act are very different. Easily. The most common names to come up at Rinko Kikuchi and Ming-na Wen (who, to be fair, is Chinese rather than Japanese, but it’s still a hell of a lot better). And there are probably also a ton of other unknowns who are good enough to do it but don’t have the same name recognition. For those that don’t know, “Ghost in the Shell” refers to human consciousness (or ghost) in a artificial body (or shell). Kusanagi’s body is really just a machine that her consciousness has been inserted into. While this doesn’t alleviate the problem of whitewashing, it is a sensible story reason why a Japanese character doesn’t look Japanese. She just chose to insert her ghost into a shell that looks like Scarlett Johansson. Yeah, in-universe it’s possible. The catch is, she specifically chose this body because it’s a common but good model – it’s basically the iPhone of android bodies. And this all takes place in Japan, which is where this technology originated (I believe, I’d have to check to be sure). Given that, what’s the likelihood that such a body would be Caucasian instead of Japanese? I’m really just joking with my post – it would still be whitewashing, but at least it wouldn’t be human-washing an android. 😛 But seriously, there are high-quality robots that look like Japanese people anyway, so even then it wouldn’t be an excuse. It is a lot cheaper and simpler to cast Asian actors. Hollywood is worried about having no big names in it, which is silly because some of the biggest movies in the last decade have had relatively unknown actors and actresses lead in them. For whatever reason Paramount thinks this is a movie that needs big stars, but there is a way around that without being accused of whitewashing or racism. Cast a Japanese actress like Rinko Kikuchi as Motoko Kusanagi and then set the movie in the US. Surround Rinko Kikuchi with some big name actors (I wouldn’t want Channing Tatum but for some reason I see him being cast in this…) Now they have a Japanese lead and the big names they crave. On top of that the door is left open for sequels that are set in Japan and they can deal with the same scenarios the anime dealt with.